For the past year, we have sold Daybreak game cards in select U.S. retailers (Walmart, Target, GameStop, Toys R Us, and Best Buy). 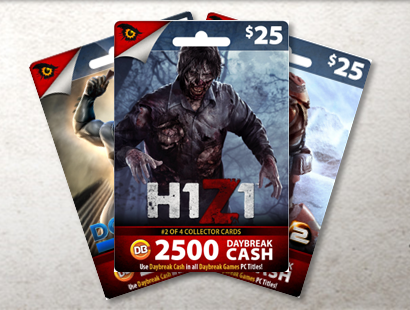 We have decided not to continue selling the physical game cards in stores; instead, Daybreak Cash (and/or All Access Membership), will be available in digital-only formats, direct from Daybreak on the web or in-game. Daybreak game cards will no longer be available at U.S. retailers beginning the week of September 26, 2016. If you have a purchased Daybreak game card that you have not yet redeemed, you will still be able to redeem it on line. Have questions? Read our FAQ below! From 12PM PDT on Thursday, September 1, 2016 until 12PM PDT on Tuesday, September 6, 2016, ALL players will receive Double [sic.] XP for Adventure, Tradeskill, and AA experience! Additionally, members will receive 40% off all marketplace items! If you’ve been waiting to pick up something from the Marketplace, now is the perfect time! Hat tip to stickmack for reporting this to us. The free Heroic upgrade icon on the Character Select screen. If the graphic is not there, just click in the empty space to the right of your character name. If you have not already got accounts sitting around with unleveled characters, the smart money here is to create a new account, roll a new character, add a Krono to the account, and bam you can upgrade that character to level 95 for free. A $60 value for $19. 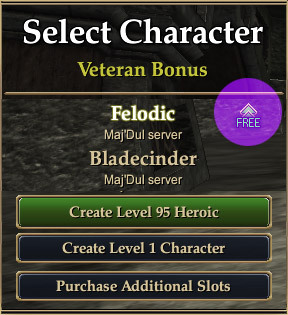 On the flipside, if you already paid $35 for a level 90 Heroic character, today’s update will not automatically ding that character to level 95. If you recently purchased a Heroic character, I might be inclined to contact Customer Service and see if there’s any wiggle room here. $35 is $35. Transfer Tokens to Isle of Refuge Available! 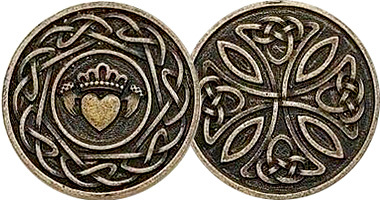 Starting today, you can purchase transfer tokens to the Isle of Refuge. 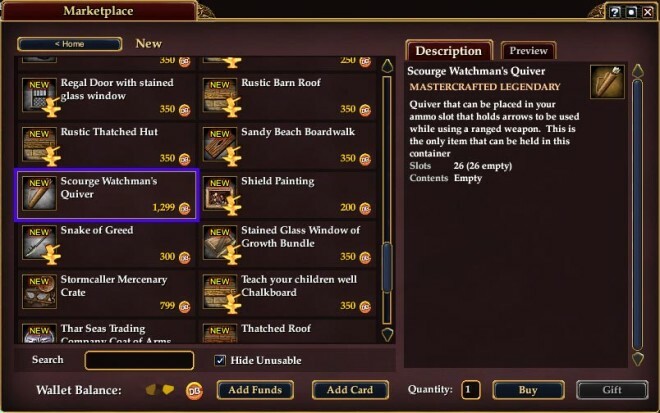 Find out more details about transfer tokens for EverQuest II in our Knowledge Base! Look to the Marketplace for new items that are available starting today! Also, members will earn bonus Ethereal coins until Monday, July 25. As of this patch, players now have the ability to display a quiver appearance in-game! Look to the Marketplace under bags > quivers for new items that let you show off your interest in archery! Quivers are priced at 1299DBC. Also, new bags are available in the Marketplace on all servers! 66-slot bags of a variety of appearances are available for 999DBC. Regular 50-slot bags can be purchased for 599DBC. Summer 2016 Ethereals are in full swing! If you’re not familiar with this year’s Ethereal event, check out the post here. Members earn DOUBLE Ethereal Coins until Monday, July 25, 2016 at 11:59PM PDT. Not currently a member? All Access membership has its perks! 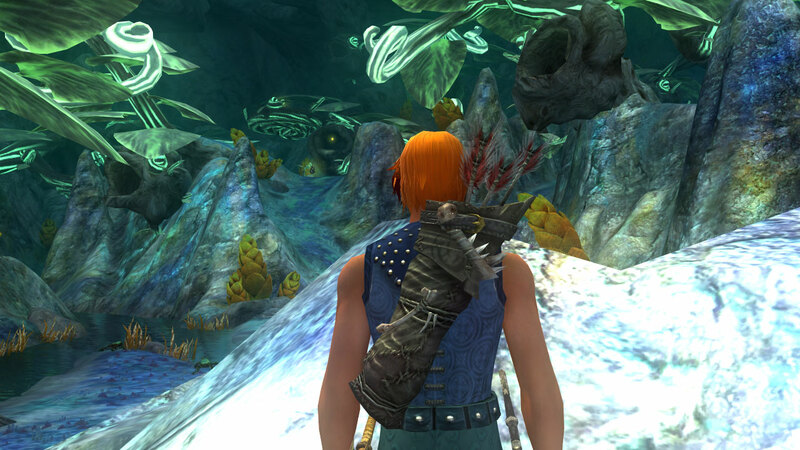 Previously, there were only a few ways to get bags with more than 63 slots — the Claws of Veeshan bag for attending SOE Live 2014, the Rallic Pack from doing the Tuesday Daily Tradeskill Mission in Tranquil Seas, and Naylie’s Nebulous Newsbag from completing the Guide quest “Nebulous Newsies“, or if you purchased the Terrors of Thalumbra Collector’s Edition for $89.99. With today’s Marketplace update, it looks like anyone can now buy 66-slot bags for $10. While it’s possible to acquire two of these convenience items through gameplay, if you want more, there’s only one choice. Are you ready for another adventure this summer? 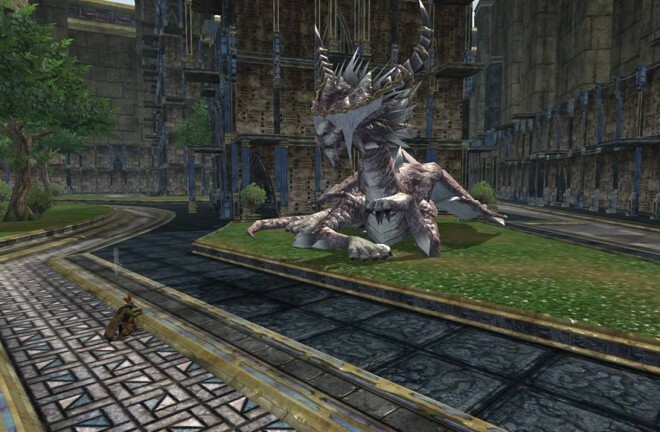 Have you been waiting to pick up the most recent expansion, Terrors of Thalumbra? Now is a great time to get it! Why? For the first time, Terrors of Thalumbra is available to purchase with credit card or with Daybreak Cash! EverQuest II: Terrors of Thalumbra is now available for $34.99 or 3499 DBC (Standard Edition), $89.99 or 8999 DBC (Collector’s Edition), and $139.99 or 13999 DBC (Premium Edition). One of the appearance items which EQ2 players have requested over the years are Quivers. With a ranger as my main character, it’s fine to travel with an appearance bow on my back, but my preference would be a quiver. Starting tonight, the [eq2u]Scourge Watchman’s Quiver[/eq2u] is now available for purchase from the Marketplace for a price of 1299 DBC. It holds 26 stacks of ammo (it currently only accepts arrows but will be updated to hold thrown ammo in a future update). Looking to snag yourself some items from the marketplace? 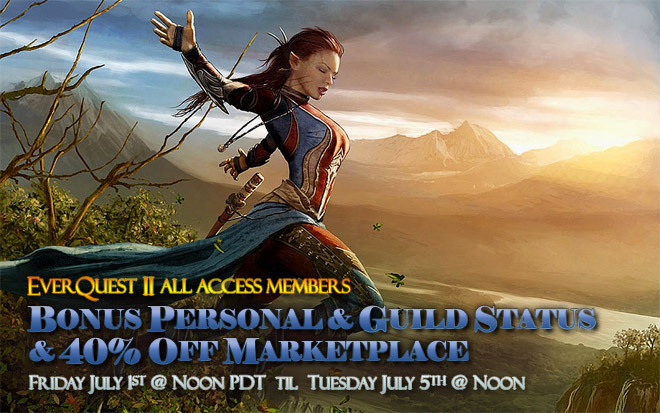 Members will receive a 40% marketplace discount for all items from 12 PM PT on Friday July 1, 2016 until 12PM PT on Tuesday, July 5, 2016! All Access members will be awarded double personal status AND double guild status for the duration of the extended weekend! Please note that double status will not be included for items purchased from vendors or the Marketplace. Launched September 5, 2007, Legends of Norrath began Sony Online Entertainment’s love affair with online trading card games. With solo and multiplayer game scenarios, players were encouraged to buy LoN card packs to build decks and play to complete achievements and for bragging rights. 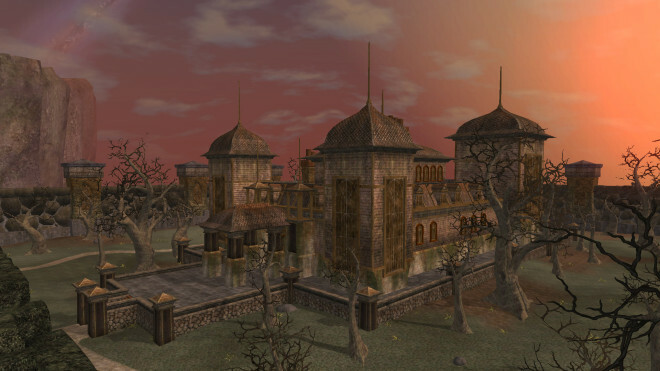 Gameplay took its cues from its real-life counterpart Magic the Gathering, although with Legends of Norrath, no physical cards were sent out — everything is virtual. 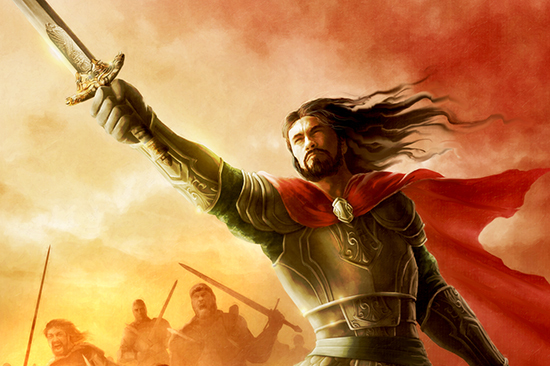 Towards the end of the Spring Update Livestream, we were informed that we’d gain the ability to acquire Legends of Norrath Loot Cards rather than the current process of buying and unwrapping dozens of Legends of Norrath game packs hoping to get lucky. The Legends of Norrath card game was recently unbundled from the EQ and EQ2 clients and now requires a standalone download and install. 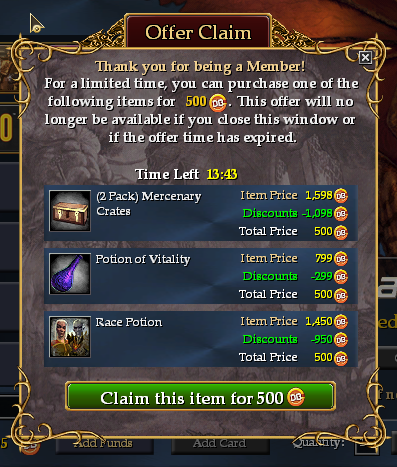 Today comes the news that Legends of Norrath “Loot Packs” are now available for purchase from the Marketplace. However rather than providing a choice of specific loot, each pack contains two random loot items. Like the Mercenary Packs, Burbur Baskets, the new LoN Loot Packs continue a trend of chance over choice. On the plus side, the loot items are tradeable on the Broker as one player found out. Even if you don’t believe in gambling, you’ll still be able to acquire items from those who do. Legends of Norrath Loot Packs are now available! What loot are you chasing? 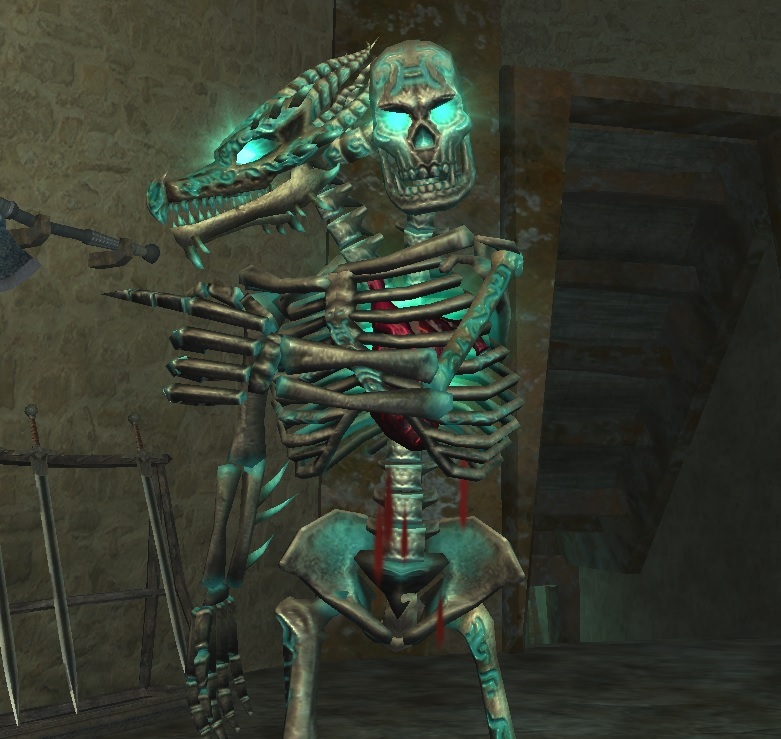 Legend of the Jarsath Destroyer is the newest Legends of Norrath loot pack. Like previous packs, each “Legend of the Jarsath Destroyer” pack costs 999 DBC and contains two (2) random loot rewards that were originally available in Legends of Norrath. The Legend of the Jarsath Destroyer packs include loot that was previous available from LON sets: The Jarsath Destroyer, Fall of the Estarim, Debt of the Ratonga, and Drakkinshard. I was hoping to login and see a new Marketplace category that would allow me to buy the exact items I want at a fair price. It will be interesting to see how many people partake of these Loot packs. New Mercenary Crates are now available in the Marketplace starting today, April 28th, 2016! Additional Frostfell themed items are available in the Marketplace starting TODAY! Which items are your favorite? For the first time, we’re putting the most popular pack of Krono – the 5 Krono pack – on sale! Beginning at 12:00AM PST on Friday, December 11 through 11:59PM PST on Sunday, December 13, you’ll be able to purchase the bundle of 5 Krono for only $69.99 USD*. Currently available in EverQuest and EverQuest II, Krono are in-game objects that can be redeemed for 30 days of membership time. They may be purchased from the Daybreak marketplace for real money only, or from other players via the broker or private trades for in-game currency. 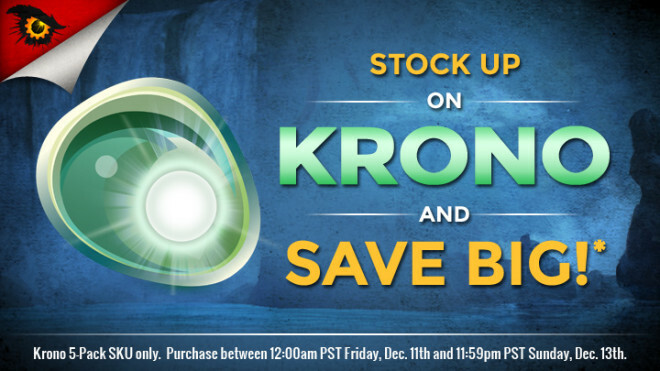 The Krono sale will be happening via the in-game marketplaces in EverQuest and EverQuest II, and on the web. For questions about Krono, visit the FAQ on either www.everquest.com/krono or www.everquest2.com/krono. *International currency prices may vary. The normal price for five Krono (redeemable for 30 days of All Access non-recurring subscriotion) is $84.99 which works out to $16.99 a month, a buck off the single Krono price. With this sale, Krono are going for $13.99, at least if you live in the USA. A player in Sweden reported that the price of 5 Krono has actually gone UP with today’s sale. From 12:01AM on Friday, November 27th through 11:59PM on Sunday, November 29th, all Mercenary Packs will be on sale in the EverQuest II Marketplace for 50% Off! Don’t go into holiday battles alone; have a merc by your side! Read More on the EQ2 Forums, including details of today’s 25% off StationCash sale. For those rare few of you who got Daybreak Games’ e-mail about the upcoming Black Friday and Cyber Monday deals (I did not, and one other person I spoke to only got ONE e-mail despite having 7 accounts), this will be old news. 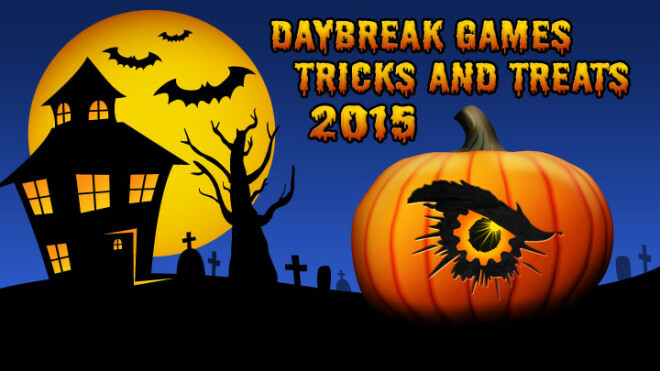 For everyone else, it looks like Daybreak Cash will be 25% off on Black Friday (November 27, 2015) and you’ll be able to get three months of All Access for just $29.99 on Cyber Monday (November 30, 2015). When Sony Online Entertainment became Daybreak Games in February, the 30-day/2000SC StationCash cards were discontinued and went out of production. Next week, the replacement DaybreakCash cards will be reaching retail stores. Interestingly, the new cards come in $25 and $50 denominations. 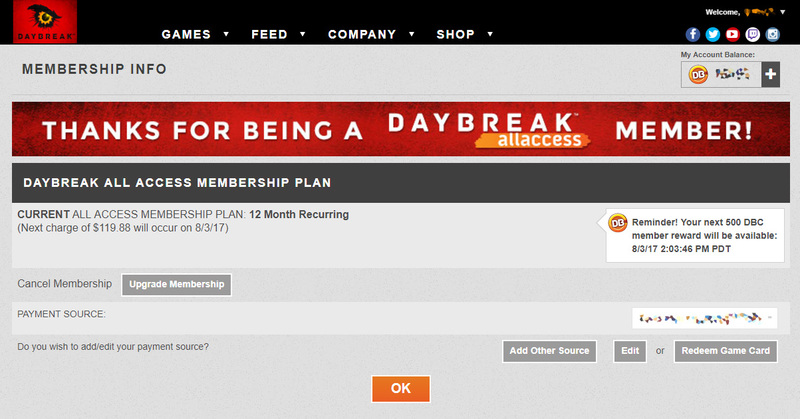 The snazzy new DaybreakCash website is a little vague on how these cards work for All Access subscription time. Fortunately we’ve learned through followup posts by Dexella that these new cards can redeemed for 30-day All Access subscriptions, DaybreakCash, or a mixture of the two. It will be interesting to see exactly how granular this control is (can a $25 card grant 50 days of All Access subscription?). Beginning the week of October 12th, you will see the new Daybreak game cards at U.S. Best Buy, GameStop, and Toys R Us retailers. In November, the cards are scheduled to be available in Target locations across the U.S. The new cash cards will come in two denominations: $25 and $50. There are four card designs in all and every retailer will get multiple copies of each card design. Collect the whole set! Daybreak Cash is the in-game currency that unlocks thousands of cool items, services, and adventures in your favorite Daybreak Games. We appreciate your patience while we roll out these new cards, and we hope you enjoy them!